Make my mom’s oven baked chicken thighs with lots of garlic and crispy skin for quick and easy dinner tonight! Also how to bake from frozen and make a one pan dinner instructions included. In 8 x 8 square baking dish, add chicken thighs, garlic, oregano, salt and pepper. Using your hands, toss to coat and let stand for 10 minutes. Preheat oven to 450 degrees F.
Toss chicken again, making sure to spread garlic and spices evenly, and arrange in a single layer skin side up, tucking in skin underneath. You want things tight. Bake uncovered for 30-40 minutes or until thermometer reads at least 165 degrees F, skin starts to brown and lots of juices accumulate in the dish. Using a syringe/baster, pour juice over the thighs and then if you like more crispy skin (who doesn’t?!) broil to your likeness. Remove from the oven, cover and let stand for 5 minutes to allow juices to settle. Serve warm, skin removed for healthier version with brown rice, quinoa or cauliflower risotto. It’s a restaurant quality date night dinner. 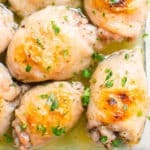 You can use either with bone in or boneless chicken thighs. My preference is bone in and skin on chicken thighs. You can bake slightly thawed and still frozen chicken thighs. As soon as you can separate frozen chicken thighs, you can bake them. Add 10-15 minutes to baking time. Just keep your pretty eye on it. To make it a one pan dinner, check out my roasted chicken thighs and potatoes.